Most people that I know have the misconception that I was introduced to polish food when Renata and I started dating back in February 2005. But the truth is that I have known its cuisine for quite a while via my ESL students who would bring their pierogis (ravioli-like dumplings), gołampki (stuffed cabbage), and bigos (cabbage and sausage stew) to class parties. In addition to that, I have been a semi-regular customer at The Polish Place (19 Corson Avenue, 718-442-8909, no website), a café and deli located just a few blocks from our Staten Island apartment, where they prepare food to order while also stocking their shelves with favorite packaged products from their homeland. Every time I walk by the store I always buy Delicje, the wonderful fruit-filled cookies made by Wedel, a large chocolate manufacturer from Warsaw that is now part of the Kraft Foods Corporation. Though I had enjoyed the food before, I had never actually attempted to cook any of it until then. 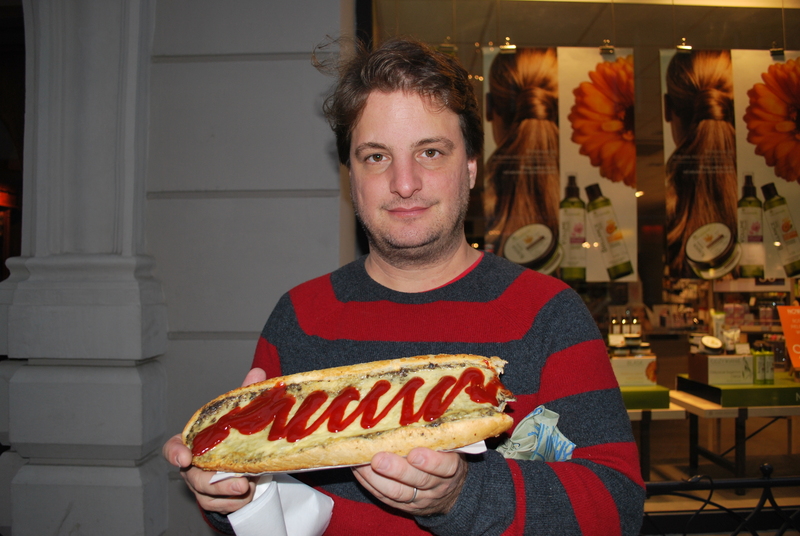 Polish cuisine had always been quite different from the fare I was used to – while I love cooking with a great variety of spices and flavor mixes (Brazilian, Latin American, Indian), and to me Polish food was challenging for lacking exactly that. Most of the foods I know are seasoned with salt and pepper, onions, dill and little else. 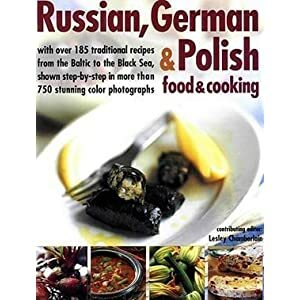 But that would not stop me from trying, and a few years back I bought Russian, German & Polish Food and Cooking (by Lesley Chamberlain, H&H Books), a large tome that detailed many recipes from the region. As I went through the book, I also did some research on other dishes and today some of them have become staples in our household. Our trip to Poland was also very eye-opening. There I experienced zapiekanka (Poland’s version of pizza) and also smoked carp wrapped in bacon served with potatoes and fresh dill pickles in addition to the more traditional foods I mentioned above. Today, I can make zapiekanka, beetroot salad, cucumber salad with dill and sour cream, salmon & eggs and other dishes from memory. Renata particularly likes bitki, which are basically chicken (or fowl) and mushroom meatballs that are coated with flour and fried. They go great both as a simple appetizer but also as a main course with a side or mashed potatoes and a green salad. I haven’t yet made any of the more laborious dishes from the book, but someday I will get there. In the meantime, I can always walk down the street. Sautee the mushrooms well in butter, allow to cool and mix into ground chicken in a large bowl. Fold egg yolks, bread crumbs, nutmeg and salt and pepper and mix well. Beat egg whites until they are consistent and fold into chicken mix. 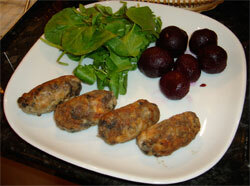 Form sausage-shaped meatballs (about 3 inches long by an inch in diameter) with your hands and roll into flour. Heat oil into nonstick pan and fry bitki until golden brown, turning frequently. Serve hot.